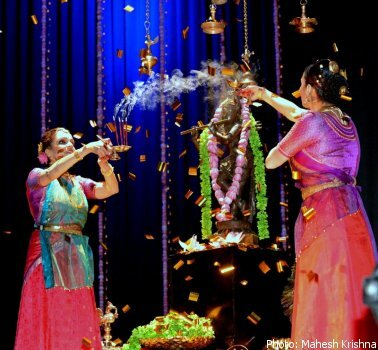 Anita Ratnam and Pritha Ratnam presented SWARNA KANNAN: The Golden One, a tribute in song and dance to Ambujam Krishna. Program presented by the family of Ambujam Krishna. Nothing less than the best is expected from the Ratnam sisters and Swarna Kannan was beyond spectacular! Graceful and beautifully clad ageless beauties Anita's and Preetha 's performance was precisely choreographed and eloquently narrated Ambujam Krishna's compositions. 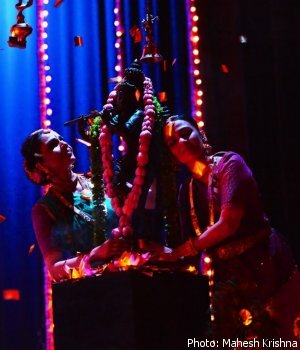 It was as if Lord Krishna was within the audience's grasp and His grace would shower on all just as Om Namo Narayana was chanted as a concluding finale! A divine and soulful production that left me wanting for more!